Moving real-life stories of that everyday miracle - birth. Like Beth McCrae’s bestselling Outback Midwife, these real-life stories come from Australian midwives working in the outback, where they share their experiences of that most commonplace but miraculous event, the birth of a child. Sweet, funny and sometimes sad, these stories share what it is to be an Australian midwife in remote areas where resources are limited. A moving and celebratory collection of tales that brings you close to the drama and wonder of birth. 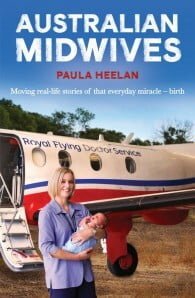 Each of the thirteen midwives in this book work in extreme locations with few resources, but armed with only courage and skill, they regularly save lives and birth babies in difficult circumstances —on an airstrip, a cattle station, a dinghy (knee-deep in water with a wary eye out for the local croc), a troop-carrier or in the face of a cyclone. These stories are a tribute to both the skill of the midwives and the courage of the mothers. For these women, midwifery is not just a job – it’s a committed and passionate way of life.